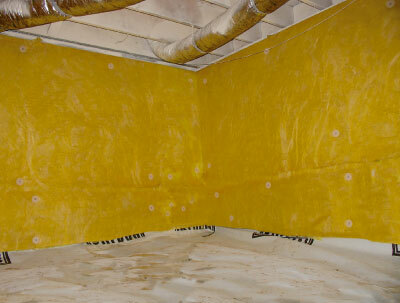 CIB stands for Commercial Insulation Board. This commercial quality product is brought to you by DryDog Barriers primarily for use in the construction of closed crawlspaces. CIB is faster and easier to install than other insulation board products and provides superior performance inside the crawlspace. Use CIB to insulate and cut down on mechanical noise inside the crawlspace, give a clean finished look, cut down on installation time, get more system flexibility due to the flame retardancy rating, and cut down on material costs. CIB’s primary function is as an insulation board for the construction of closed crawlspaces (sealed crawlspaces, conditioned crawlspaces…). CIB is used where board stiffness properties are required and also functions as an exterior insulation when covered with a weather barrier. CIB is used in exterior curtain walls, interior walls, floor/ceiling assemblies and as an exterior insulation on HVAC ducts and plenums or in constructions where framing is not present. It is also used as thermal insulation on tanks and vessels. CIB provides high sound absorption and excellent thermal performance. The product can be easily cut, handled, fabricated and installed. CIB is UL listed. For more benefits as compared to other products see the attached sheet CIB vs Polyisocyanurate Insulation. The product is composed of glass fibers bonded together with a thermoset binder. Insulation should be kept clean and dry at all times. CIB is manufactured according to ISO 9000 standards. Exterior Walls – Install a vapor barrier towards the interior side of the structure, except in warm and humid areas where local code regulations may require a vapor retarder to face toward the exterior. Curtain Walls – CIB is applied to spandrel and precast concrete panels with approved adhesives or mechanical fasteners. Boards may also be installed using hat channels or Z studs. Where a vapor retarder is required, all joints, seams and penetrations shall be sealed. Exterior applications require the insulation to be covered with appropriate weather barrier finish. Choice of finish depends on mechanical abuse, weather exposure, and appearance requirements. HVAC/Mechanical – All fabrication, application and installation steps should be in accordance with the requirements of the National Commercial and Industrial Installation Standards (current edition) published by the Midwest Insulation Contractors Association (MICA). These installation recommendations are general in nature. Other methods are acceptable. Please consult your contractor or DryDog Barriers for recommendations best suited to the applications. An inspection and preventative maintenance program for the insulation and vapor retarder system is recommended to ensure optimum performance. Technical assistance can be obtained from info@drydogbarriers.com.